Bagh Ibn-e-Qasim, Karachi’s largest urban park, sprawling over 130 acres, has been in the news alright. The latest bit of news was that the Sindh High Court (SHC) suspended the operation of the provincial government’s notification handing over Karachi’s largest public park to the estate giant Malik Riaz for Bahria Town. Till the next hearing, this notification shall remain suspended. The reactions against the idea of the Bagh being taken over were mostly emotional. Yet, few noticed that the park had been dying since the last few years, bit by bit, with every fading tree and plant, and especially with the closing of the main entrance. One year ago, even the battery and UPS of the big clock in the Bagh were stolen. The number of those frequenting it dwindled over the years. Whether Bahria Town takes it over or not, the fact is that Karachiites are paying a price for the ‘development’ in the megacity with the shrinkage of public places. Worse still is the Karachiites’ aching nostalgia that comes with it. Where once there was Playland, Aquarium, and the main entrance of the Bagh, is now a void. A resident of this area says that he has seen the so-called development happen overnight as the entire area was well and truly encroached upon. “In the evenings, the Bagh used to be packed with youth, children and families. This park was the most well-lit part of the entire Clifton area. It used to be open almost till midnight,” he says, echoing the memories of many city-dwellers. “The weather would be cool in the evenings close to Karachi’s famous seafront. Standing in the bandstand and looking out at the sea was a fantastic experience,” he reminisces about the evenings spent at the park with his family. Trees would provide shade to people and encourage them to flock to it even during daytime – the footfall was in the thousands. There was a mosque where visitors could go to pray, and there were foodstalls outside. “The park had nice horticulture. Plants were shaped as animals. All of that faded. The grass used to be green; now it’s just barren sand over there,” he regrets. Many public events, such as the centennial celebrations for the renowned poet Faiz Ahmad Faiz in 2011, were held there as the huge park grounds could accommodate large numbers of visitors. Few noticed that the park had been dying since the last few years, bit by bit, with every fading tree and plant, and especially with the closing of the main entrance. One year ago, even the battery and UPS of the big clock in the Bagh were stolen. The park has seen better days. He thinks the Bagh has been in doldrums for quite a while now. “Yet, none of the politicos or members of the civil society making such a hue and cry of it being handed over to Malik Riaz did anything whatsoever to better the plight of this once spectacular park”. Qasim Bagh in the glory days. The deterioration of the park did not happen overnight. For years, its main entrance was adjacent to where the Bahria Icon Tower looms today. When the construction of the skyscraper began, the main gate of the park became the entrance point for the site office. As a result, the gate was closed down. With the construction of an underpass, the Kothari Parade access points changed as well. The other entrance to the park is the one which faces the sea. There is very limited public transport on that route and since a vast majority of visitors were ordinary people travelling in buses, the numbers began to drop. Having to walk long distances, and parking problems for those using personal vehicles made it more discouraging. One of Karachi’s most diehard chroniclers, Ghazi Salahuddin, says he had been observing the deterioration of the Bagh, and feels this was neglect with an agenda. “It’s not just about this Park; it’s about Karachi as a whole. This city’s civic life has been plundered. From public spaces to transport to garbage collection – the government is not performing its civic responsibilities,” says Ghazi, dismayed at the bad condition of places such as Qasim Bagh. “These shared spaces are so precious. Karachi’s cultural life has also been effected by neglecting them,” he says, and adds that whenever he visits Lahore, he feels Karachi is no longer the city of lights, but it is Lahore now. Whether this disrepair is because the inflow of visitors decreased or was it done by design is debatable, the resident thinks. “It would be silly to assume that residents of the high-rise would want a view of a park in shambles. When the entrance of the mazaar and park was changed, it warded away ordinary people. Who would want ordinary people around such prime, expensive real estate property?” he asks. He also comments that the stake of Bahria properties in Karachi raises questions, “considering that regulations have been circumvented and even broken to facilitate these properties”. If Karachiites are getting another chance at utilising this park for the benefit of citizens, then as Paracha suggests, more should be done to maintain Bagh Ibn-e-Qasim while it’s still there. Posted in Karachi and tagged Bagh Ibn-e-Qasim, Bahria Town, Ghazi Salahuddin, Karachi, Malik Riaz, Nadeem Farooq Paracha, Norbert Almeida, Qasim Bagh, Urban Development, Urban spaces, Zarrar Khuhro. Bookmark the permalink. Awareness needs to be raised among parents. Living on the fringes of one of the most affluent areas of Pakistan’s mega city Karachi, 39-years-old Nazeeran Bibi’s four children are not adequately vaccinated. “I got my first daughter vaccinated up to the age of six months. My second daughter has never been vaccinated. It never dawned on me that it is something important, till the school started asking for the ‘B Form’ for admission, and to get the B Form, the vaccination card is important,” says this resident of Qayyumabad. However, illiteracy is not the only factor that holds back Pakistani mothers from getting their children vaccinated. A lack of awareness about the importance of Routine Immunization (RI), and an absence of sensitisation regarding facts that dispel myths, seem to be present across the board. Across the road, there are children in upper tier homes in Karachi that have also not been vaccinated, or have not received follow-ups. Mothers remain the central piece of this jigsaw puzzle, and convincing them of the benefits of immunisation seems to be one of the key factors. Dr Asad Ali, Associate Professor of Paediatric Infectious Diseases at the Aga Khan University, with a research focus on vaccine-preventable infectious diseases and malnutrition, says that the role of mothers in this regard is critically important. “Research shows that many a times, mothers are discouraged by the common side effect of short-time fever and local injection site discomfort after the vaccination of their baby. So they do not complete the series and also don’t get other children vaccinated. What they do not realise is that these transient side effects are a small price to pay for the critical protection their baby will get by receiving the full course of vaccines,” he says. Immunisation of children under the age of one-year against major vaccine-preventable diseases (tuberculosis, diphtheria, pertussis, tetanus, hepatitis B, Haemophilus influenza type B [Hib], poliomyelitis, and measles) is one of the most cost-effective means of reducing infant and child morbidity and mortality. The government of Pakistan initiated the Expanded Program on Immunization (EPI) three decades ago to save Pakistani children from these diseases. All vaccines in the RI schedule are provided free of cost in all public health facilities in Pakistan. Even then, the children are not given the coverage they deserve. The Pakistan Demographic and Health Survey 2012-2013 sheds important light on some facts regarding the state of RI in Pakistan. Gender preference is seen even in RI. Boys are more likely than girls to be fully immunised — 56 per cent versus 52 per cent. Children’s birth order varies inversely with immunisation coverage — as birth order increases, immunisation coverage generally decreases. 64 per cent of first-born children have been fully immunised, in contrast to 39 per cent of children of birth order six and above. Urban-rural differences in immunisation coverage are clear. 66 per cent of children residing in urban areas are more likely to be fully immunised, compared to 48 per cent in rural areas, according to PDHS. There are wide differences in coverage by region. Islamabad has the highest percentage of children who are fully immunised (74 per cent), followed by Punjab (66 per cent) and Khyber-Pakhtunkhwa (53 per cent); immunisation coverage remains lowest in Sindh (29 per cent) and Balochistan (16 per cent), as per PDHS findings. However, the latter two provinces are seeing a thrust in the efforts for reaching out to children who are not vaccinated. For Sindh, fresh research shows that the numbers of covered children are rising, thanks to efforts of EPI Sindh, yet much remains to be done, and unimmunised children continue to pose a challenge. EPI Sindh’s Project Director Dr Agha Ashfaq, recently giving an overview of the programme to members of the media, said coverage of RI in Sindh has increased to 45 per cent. In view of the loss of lives of children because of Diarrhea, the Rotavirus vaccine is also being included in the RI in Sindh. Success in Sindh is being seen, for example no stock outs of vaccines were reported in 2015-16 in the province. Vaccine Logistics Management Information System (VLMIS) is being set up in all districts of Sindh. Polio Eradication Initiative (PEI) and Sindh EPI are working in collaboration. Increased mapping of urban slums is being done. There is also newfound emphasis on the monitoring, evaluation and accountability framework. However, more emphasis is needed in raising awareness among parents, especially mothers, because eventually the decision to get one’s child vaccinated or not remains pre-dominantly with them. Measles remains one of the key indicators of immunisation programmes in any country. Some 20 million infants missed their measles shots world over in 2015, and an estimated 134,000 children died from the disease. Half of the unvaccinated infants and 75 per cent of the measles deaths are in six countries; Pakistan is one of them. “The frequent outbreaks of measles in our country are a clear reminder that should convince parents about the need for vaccines for their children,” says Dr. Ali. “Mothers in Tharparkar are very cooperative when it comes to their children’s health but they need to be convinced. We have not reached out enough to create awareness among the mothers,” says Dr. Aziz Kunbhar, former District Health Officer in Tharparkar. Posted in Health and tagged EPI, Expanded Program on Immunization, GAVI, Routine Immunization, UNICEF. Bookmark the permalink. Mera Karachi Mobile Cinema celebrates the life and times of Karachiites through an art by the people and for the people. “People who saw the video liked the spot where it was shot on the Seaview beach. They still come to me, requesting to shoot a similar video of them at the same spot,” says 28-years-old Basheer Muhammad, one of the citizens of Karachi who was part of videos shot as part of the Mera Karachi Mobile Cinema (MKMC) project. 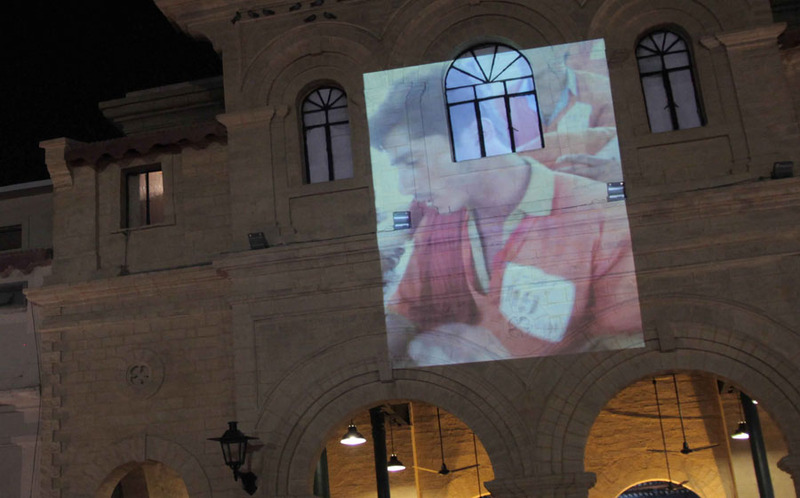 The project used a rickshaw powered projector to show cell phone videos in diverse neighbourhoods where the videos were made. Basheer was the community coordinator for the screenings at Seaview. For Basheer who makes a living by photographing tourists along the Seaview beach, being part of a video project was something that left not just fond memories but a sense of ownership about his city. These outdoor screenings were free of cost and were held in various parts of Karachi, thereby creating an archive of cell phone videos about everyday life of Karachiites. “This project was not a political reportage. We were not trying to be native informants. This project gathered Karachiite’s spaces and moments of leisure in the city,” says Yaminay Nasir Chaudhri, the key person behind MKMC. Mera Karachi Mobile Cinema was a way of engaging with different publics, explains Chaudhri. “We wanted to change the relationship of people to media. Normally the people we met and worked with were consumers of the media, but did not get to produce it themselves. In MKMC, they had a chance to make media and if they wanted to, to represent themselves.” The approach was participatory. The MKMC team would teach basic video making and editing techniques using cell phones. Members of the community became collaborators and a part of the creative process. They could, for example, express their choice for music or particular scenes they liked in the videos they made, and want the MKMC team to fine tune that. “We would work on it together. It was a very important aspect of the project to create a sense of ownership and agency over the images we put out in the world,” says Chaudhri. Karachi is a melting pot of different ethnicities, languages and cultures. This series of videos, though limited in number, were aimed at being snapshots into life of Karachiites from all walks of life. They were produced in response to the question “Home: What did you do last Sunday?” A Mobile Cinema Rickshaw carried around the projector that projected these videos on walls of houses, railway bogies and buildings, added another dimension to it that is typical to life in Karachi. The project celebrated the life and times of Karachiites, and created a new use of public spaces. This was a use of art that was not a luxury for the elite – it was by the people and for the people. The MKMC team was headed by Yaminay Chaudhri. Other team members included Cyrus Viccaji, Sadia Khatri, Mohammad Saddique Khan, Khadija Abdul Lateef, Krishna Raju and Farhad Mirza. Areas that were covered included Ibrahim Haidery, Lyari, Cantt Station and Seaview. Karachi’s migrant communities were also focused upon. Some of them have been living in the city since decades but still do not have legal status here. The videos, simple at a glance, were conceptually layered, tapping into complex themes like identity and ownership. Both regular and irregular settlements were tapped into. Vernacular aesthetics and tools were used in this project. The rhythm of the city was important. These videos were not made for an international audience, which helped deliver a more fluid and organic narrative. “Often when films or documentaries are made for a global audience, producers end up orientalising, objectifying and exoticising Pakistan, resorting to stereotypes about terrorism, and over simplification of people based on ethnicities,” explains Chaudhri. “MKMC is an incredibly diverse and inclusive project. It’s so beautiful how it’s rooted deeply in Karachi and its inhabitants, building a poignant and personal archive of all the vulnerable and aspirational relationships we have with the city, its public spaces and communities,” says Abeera Kamran, a graphic designer and web developer who worked on the website of Tentative Collective. She adds that it’s so rare to find artists that are committed to such collaborative intersectional work. The screening of videos in MKMC created an alternative narrative in public spaces. The screenings fostered new kinds of conviviality in these neighbourhoods and leftover spaces of the city. In Lyari, in one screening, some 300 people, mostly women and children, came together on an empty parking lot and street in the middle of Baghdadi. “Our gatherings never used security apparatus and we never had any problems. The feeling of community and desire to be in a public space together doing something fun was a kind of organiser in itself,” says Chaudhri. MKMC made an effort to hire a few people from each neighbourhood they engaged with as community leaders. They offered salaries to the ones who wanted salaries and support in other ways to those who were insulted by the offer of money. The project took one year to plan and ran for three years. It involved applying for grants, crowd sourcing, personal savings and getting funding from friends. The second phase of the project, still underway, involves the showing of previously unshared parts of MKMC, a documentation of the process, and analysing what the team learnt from it. According to Chaudhri, the MKMC team wants to look at what gets deleted, what is deemed screen worthy and what is not. As artists working with new collaborators, they also want to decipher what it was that they saw in these engagements with unlikely friends. MKMC was a project of the “Tentative Collective” — a collective of people who share resources to create critical works of art in public places. The Tentative Collective is currently working on a project exploring some of the outcomes of modernity and development, working with literal and metaphorical notions of waste and wasted lives. Posted in Culture and Society and tagged art, Karachi, Mera Karachi Mobile Cinema, Tentative Collective, The news on sunday. Bookmark the permalink.